1. 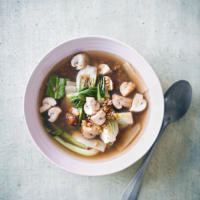 Heat the oil in a large saucepan and fry the white parts of the pak choi, plus the mushrooms and ginger for 1-2 minutes. 2. Add the vegetable stock, five spice and bamboo shoots, and bring to the boil. Cover and simmer for 5 minutes. 3. Heat the grain pouch according to the pack instructions and stir into the broth, along with the green parts of the pak choi. Heat until pak choi is wilted.